Hi loves! How are you today? I am doing fine, my vacation is coming to an end.. oh well, without work it wouldn't feel like vacation right ;-)? 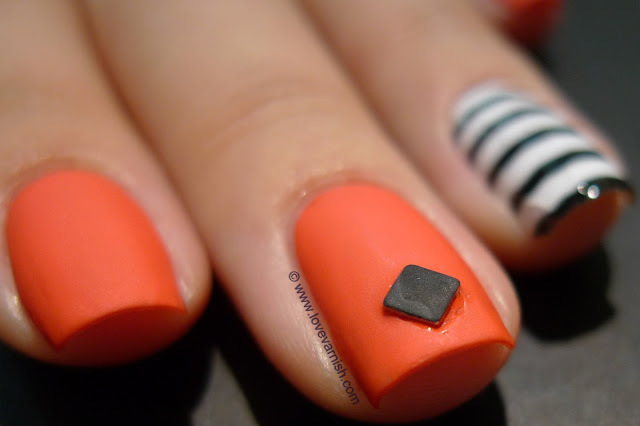 Today I have for you nailstrips from the brand OMG. I'll admit I am not the most experienced user of nailstrips, usually I change my polish everyday so it feels a bit like a waste to use something that is intended to sit on your nails longer than 1 day, right? But, when they contacted me for a review and I took a look at their site, I saw some fun designs and decided to try them. The design I am showing you today is a black and white horizontal stripe. I really liked this design and immediately knew I wanted to pair this with a bold color, which is OPI My Paprika Is Hotter Than Yours. I chose to mattify it because well, I just felt like it LOL! Now for the nailstrips. I didn't follow the exact instructions as stated on the package because it involves a lot of soaking and lotioning and that sounded weird to me. First you have to try and pick the right size. I had some trouble with this because my nails are quite skinny. I first used the 10mm on my ringfinger, but it was too small. The 11,5mm seems like a good size but I have to align it perfectly or it'll hit my skin. For my thumb I thought I needed the 14,5mm but 14 (not included) would have been better. At least I know now I have to trim one of the strips for my thumbs in the future :-). After picking your size, lay them down in the order you want to use them. Instructions say you first have to peel off the clear protective film on the front, but instead I peeled off the paperbacking first. These strips are very stretchy and sticky and keeping the clear film on helped me get them on the nail I actually wanted them. Then, take off the clear film and start smoothing the strip. As you can see there are little tears in my strip. This did not occur with applying and stretching the strip, it was already there when I took off the paperbacking. Also, I couldn't get them completely smooth on the tips but that might be user error. I can't say I recommend these or not, I'll have to try them some more before giving my final opinion! What do you think of these nailstrips? Have you ever tried something like this before? OMG Nailstrips are available on their own website, you pay $20 for 4 packs of nailstrips. You can also find OMG Nailstrips on Facebook and Twitter. I have some nail strips, but I have not tried them yet. I have skinny fingers so I think I might have to do some trimming to fit my pinky and ring finger. The polish is gorgeous, your ring is gorgeous, but I genuinely think the stripes you do yourself are 100% times better. I don't use nail strips or wraps either because they would really annoy me until I had them picked off, but I guess they're good if you didn't do any nail art! I like nail strips, but only when they have patterns or designs I couldn't make myself :) I love how you paired these with the matte orange! Yeah if your nails are small trimming will be needed. Aww thanks dear, that is so sweet of you! I know I can do stripes like that just as pretty without the hassle of applying and such - I am just not wowed yet by any nailstrip! Thank you! I was very happy with the combo too :). I love how you used this! I kinda wish there were options for people like us with skinny nails. Like making a regular pack and a skinny nails pack...why hasn't anyone done that?!? Aaaah yes kinda like ASOS Petite LOL! You are a genius! Let's go and get together and release skinny nail wraps, we'll be biljonairs ♥.